Organizations struggle to invest in research. Historically, research methods are time-consuming and they don't always result in actionable insights the business can use immediately. 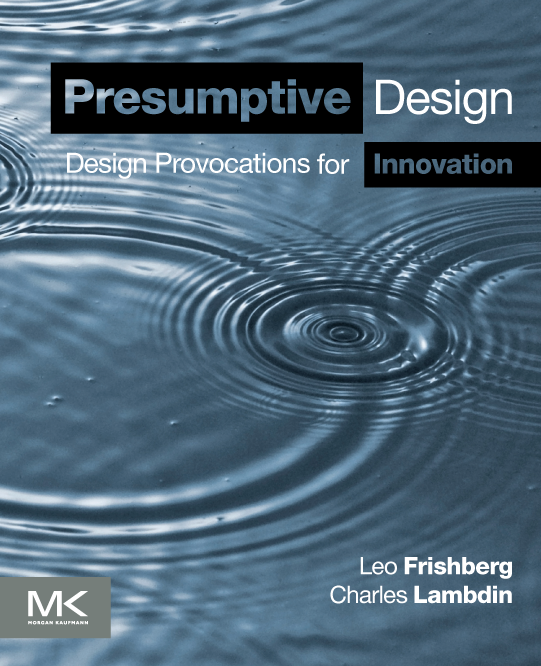 Presumptive Design is an approach I landed on (I made up the term in 2004, but have been using similar processes since the mid-1980s) to address both of these concerns. But just because I had a system didn't mean everyone would immediately understand it, how to apply it, or get trained on its details. And just because I had a book didn't mean it would sell itself. A 400+ page book, published by Morgan Kaufmann with 100s of figures and illustrations, including contributions by many leading figures in UX. In addition, the book has spawned a series of workshops, tech talks and online discussions as organizations begin to learn more about how it can reduce their time to insights. And of course, a website, the design for which I was also responsible. Writing a book is pretty difficult. Writing it with a co-author could be difficult, but in this case, Charles Lambdin and I collaborated beautifully. After we decided we'd consider writing a book, we approached numerous publishers. Our effort began in earnest when we started crafting the applications for submittal: a table of contents, an example chapter, a pro-forma business case, competitive offerings and the like. Once Morgan Kaufmann struck a deal, we wrote 75% of the book in about six weeks. After receiving our reviewer comments, we rewrote the book completely, striking chapters, and adding new ones. After a final round of reviews, we completely rewrote the book a second time, tightening the prose. By this time, six months had passed since our initial rough draft. And then the manuscript editing process began. With over 14 revision cycles, including a false start with the initial printing run, the book finally made it to the shelves - almost 15 months after we had begun. Although I coined the term Presumptive Design back in 2004, I have been using the method most of my professional career. Charles and I don't claim to have "invented" the method, we're just the first to write a detailed "how-to" book about it. I was responsible for 50% of the writing, and most of the editing and revisions. Charles and I crafted almost all of the illustrations, together and separately, with the exception of some excellent pieces generously provided to us by their creators. I was responsible for negotiating the contract with MK, along with all other legal and operational efforts. An enterprise as large as creating a book takes a team of people. We are indebted to many individuals who helped us improve on our initial drafts, not the least of which were our reviewers, Tim Piwonka-Corle and the late, great Steve Sato. In addition to Steve challenging us to think more deeply about our arguments, he contributed a case study to the book. Steve will be greatly missed. We owe a huge debt of gratitude to our associate, Kim Buckley for the book's visual design and layout . Kim worked with us to create the initial font, layout, color and stylings. Once she had established a good foundation, I continued the effort throughout the publishing process. And of course, we couldn't have done it without our team at MK. Our editor, copy-editors and copy-setters who went through 14 separate revisions and a complete reprint. The final result is all the better for their diligence.